In Dallas, the struggle for those who claim to be “Christians”, isn’t persecution, it’s living “set apart”. A lot of people attend church in Dallas but very few live in a way that would show they served God. How do we as moms who love God wholeheartedly and want to serve Him make Him known? Particularly in a community where everyone goes to church, is involved in humanitarian efforts, and may even attend a Bible study? I’ve lived in places like San Francisco where wearing a ring with a cross on it made a bold statement for Christ. It was easy to be “set apart”. Believing in God was enough to make me different in that community. 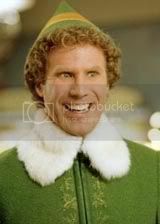 One of our family’s favorite Christmas movies is “Elf” with Will Farrell playing the main character “Buddy”. If you haven’t had the pleasure of watching this fabulous flick, then let me give you a quick synopsis. . . Buddy is a human who was raised by Papa Elf in the North Pole. One day when he struggled with not belonging in the elf world…not fitting in. His adopted father told him about his biological dad and how to find him in New York City. What we love about Buddy is his enthusiasm and childlike-faith in all things Christmas. There is no doubt in his mind that Santa exists because he knows Santa. There is joy in all things related to Santa and Christmas. Most importantly he is determined in everything he does to share that passion with others. Buddy was “set apart” in New York City. Everything he did (even how he dressed) was different. He whole-heartedly believed in something. He didn’t believe begrudgingly. He believed with enthusiasm, joy and passion. He couldn’t help but share his love with others. How do we stand out in our own communities? Do we have that kind of passion & joy for our God? Our God is so much more amazing than the “god” that Buddy believed in. Our God doesn’t make toys and deliver them in one night. Our God created the entire universe! Our God saw us in our sinful state and instead of condemning us, he was gracious enough to send His own son to die for us (John 3:17). That’s something to celebrate! Why don’t we share God with those around is in a way that draws them to His heart? Why do we act like Christianity is a burden? Why do we allow the activities to take away our joy instead of doing them out of joy? How are we “set apart”? Maybe one way we can stand apart (particularly during the holidays) is to Buddy’s favorite thing–> SMILE! This is SO true! I hope I never watch the movie again without thinking of that! You always have great illustrations and I appreciate that you are so faithful to share! Thank you. I think it’s important, though, to recognize that joy and happiness are two different things. For me, I see joy/experience joy when I am focused on God and His Hand in circumstances (good and bad), but I am not necessarily in a “happy mood” in every circumstance. Since God is more concerned with our holiness than our happiness and we are promised that we will be given trials so that we might be more conformed in HIs likeness, we can be joyful in the hardships of life because we know that God is working on us for His glory. As I go about my day doing my primary ministry (loving and serving my family), I don’t “feel” joy like Buddy felt joy, but I am SO thankful that God’s Hand is on, and thus I have the Spirit’s gift of joy. Good point misty! I think that what we love about Buddy is not that he is just “happy” but that he fully believes in all things Christmas and he experiences simple joy in believing. I think that those whom I know who are truly finding joy in their relationship with Christ show it in their interactions with others. They are unconcerned with what others think of them. They are fully consumed with the love of their Father and can’t help but share that with others. Different from happy. Deep joy and love. Thanks, Heather. Yes, I agree that it is obvious when someone has a deep, fulfilling love relationship with God! I appreciate you!